Another high school hoops season is upon us in the Big Apple. What should we expect? Well, in the PSAL AA Division, perhaps more parity. Last season, the PSAL AA Division was top-heavy, with Thomas Jefferson, Abraham Lincoln and Cardozo showcasing an abundance of talented players such as Shamorie Ponds, Rasheem Dunn, Cahiem Brown, Aaron Walker and Ray Salnave. Jefferson ultimately prevailed, winning its first PSAL title since 1954 and then the New York State AA Federation crown. Although there should be more balance this season, Jefferson, Lincoln and Cardozo all figure to be contenders again. One team to keep an eye on is Queens High School of Teaching (QHST). They were one of the few teams that beat Cardozo last season and they have many players returning, including CJ Kelly. John Bowne has graduated to the grueling Queens AA Division, where they will face the likes of Cardozo, Construction and the aforementioned QHST. Francis Lewis and Springfield Gardens made similar jumps last season. In the CHSAA AA, it could be the opposite. Last season saw great parity from top to bottom in both the Brooklyn-Queens and New York Divisions before Xaverian made its impressive run to capture the 2016 CHSAA AA title in what turned out to be a swan song for Jack Alesi's standout career. First year Xaverian Head Coach Tom Burns will have his hands full in the CHSAA B/Q Division this season, with Archbishop Molloy, Bishop Loughlin and Christ the King all looming as potential City Champs. Molloy returns Cole Anthony, Khalid Moore and Moses Brown; Loughlin returns Cincinnati commit Keith Williams, Markquis Nowell and Jordan Thomas; and Christ the King returns Georgia Tech commit Jose Alvarado and Kofi Cockburn. Moving to the CHSAA's NY Division, St. Raymond, even after losing Sidney Wilson to prep school, still boasts returning point guard Isaiah Washington. Similarly, Stepinac lost national standout Jordan Tucker to an out-of-state transfer, but still has Jorden Means returning. Iona Prep returns top prospects Bryce Wills, Josh Alexander and Souleymane Koureissi. 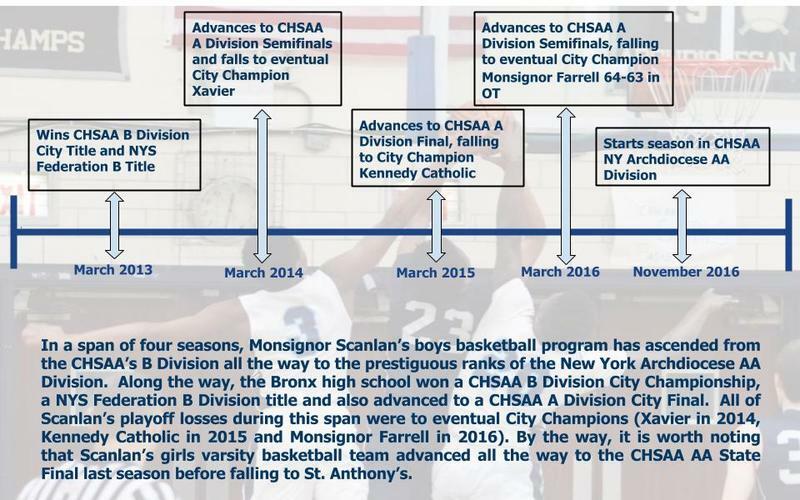 Scanlan moves up to the AA Division this season, capping an amazing ascension that started in the CHSAA B Division four-seasons ago. As usual, it should be an exciting season for HS basketball in NYC and we look forward to getting out there and covering the action.